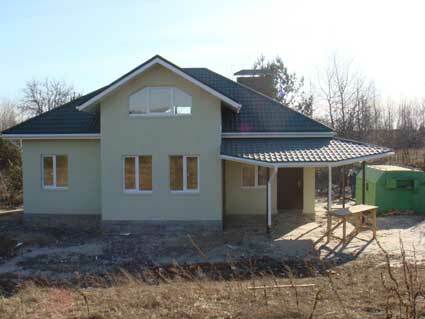 My house.All about construction of the house. Hi! Dear friend.I build the house. On this site I shall tell about construction of the house. I very much would like that it was warm and cosy dwelling. 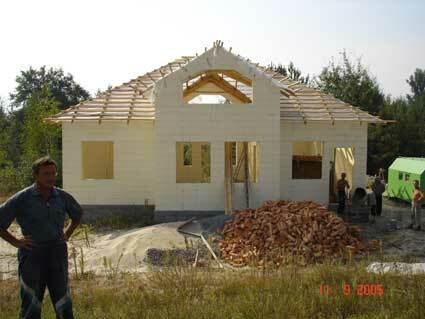 If you have advice that construction of the house was successful, write to me please. KWARTSCOAT Structural paint KWARTSCOAT (Holland) on the basis of artificial pitches and fine quartz sand. 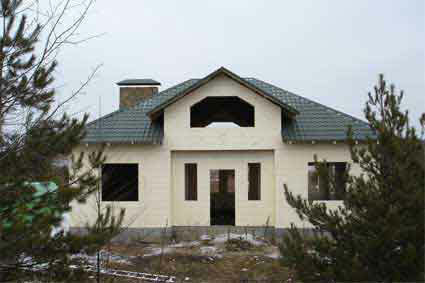 Structural paint used for internal and external painting the house. Well hides roughnesses. 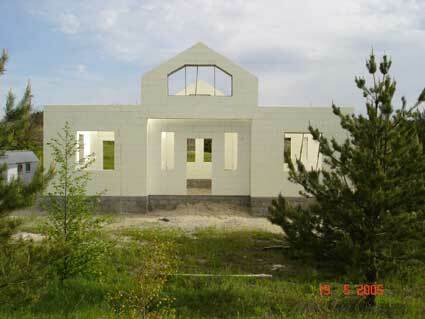 Allows to create various structure. Is put by the structural platen or method of dispersion. Primary colour - white. Is fine used in more than 500 colour shades. Roof is constructed of a metal tile of firm "Ruukki"
Metal tile Ruukki For today the standard of quality is steel of Finnish metallurgical concern Ruukki. What factors promote success of this metal tile? * Qualitative steel of metal tile Ruukki (guarantees both plasticity of a metal tile, and stability to deformation). 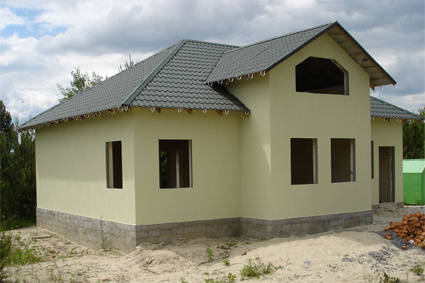 The company makes some kinds of a structure metal tile and the big set of additional elements that allows to construction any roof completely. 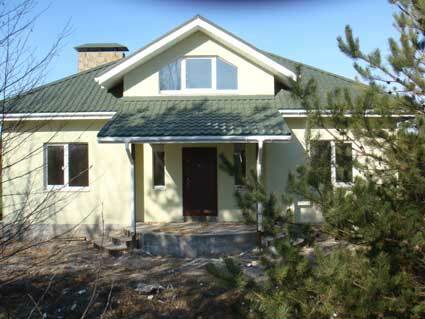 The Finnish steel is covered by a sufficient layer of zinc, means, corrosion Roof å does not threaten. The layer of zinc and a first coat does not change from a party to a party. To guarantee quality of steel, the laboratory on manufacture watches stability of properties of steel, a layer of zinc, a polymeric covering. One of advantages of a metal tile - a wide range of colors and figure. 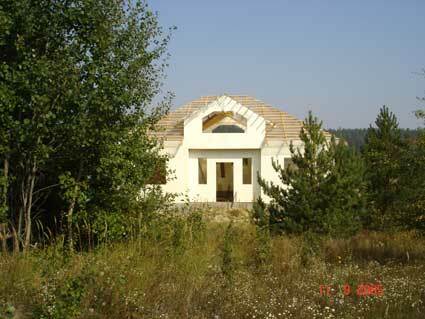 At a choice of color of the future roof I recommend to consider design of the house and surrounding landscape. 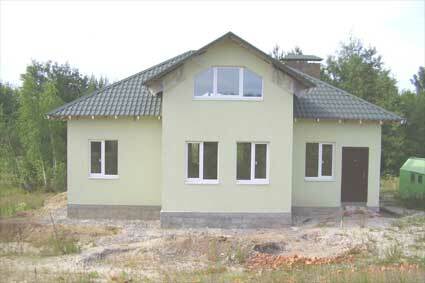 In the house are established windows from Firm KBE. 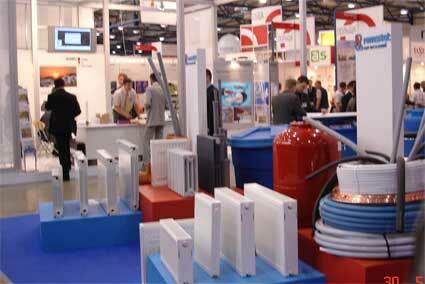 DM KBE - the leader in the market of suppliers of a high-quality German plastic structure for windows and doors. 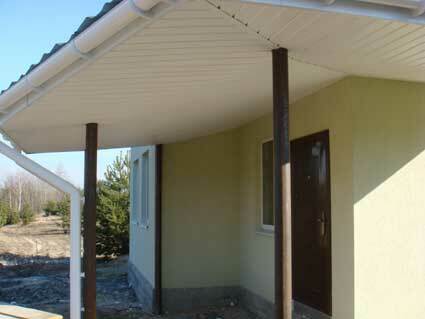 Structures for plastic windows do (polyvinyl chlorid) on the basis of PVC. PVC receive from natural raw material: salt and oil. PVC is chemically neutral, that is does not enter reaction with air and a moisture, is harmless. Since 2004 of PVC-STRUCTURE KBE it is made on technology green line which has allowed to exclude the lead harmful to an environment from structure of PVC. 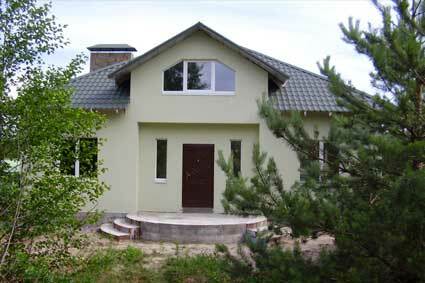 Windows from such structure resist to a bad weather is better and are more durable in an excited environment. 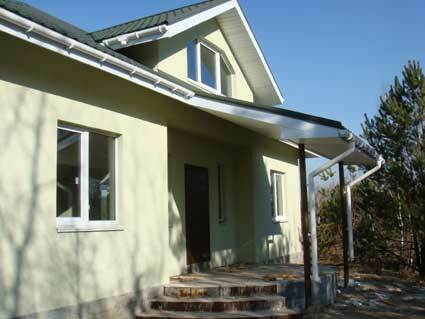 New technologies provide to windows KBE aesthetic advantages. Surfaces of the structure created on technology " green line ", have steady matte shine. For protection of a roof against water we used the reinforced membrane Strotex 110,140. >Strotex 110,140 membranes protect the roof structure against water runs and cover the heat insulation layer against external moisture. >Strotex is to remove vapor in the roof insulation. 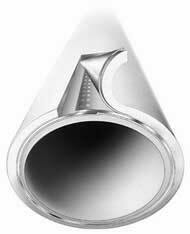 >moreover,the foil constitutes protection layer against escape of heat from the roof insulation layer. Water-waste systems are applied to creation of the organized water-drain from a roof. 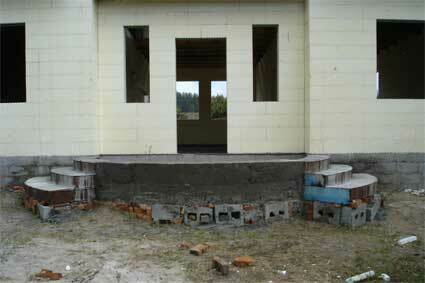 The water-waste system gives to facades the finished kind.There are different kinds of water-waste system. I used system of firm Plastmo.Danish firm PLASTMO A/S is one of world leaders on manufacture of rigid plastic water-drains from PVC. The system of rain drains Plastmo gives to the house stylishness and completeness, including executions of direct function, that is preservation of walls from direct hit of water.Advantages of water-drains Plastmo are obvious - plastic does not darken, does not fade, does not become covered by oxides and is not subject to corrosion. The system is made from strong PVC.Original constructive elements allow to transfer easily any temperature differences, and installation by means of special glue guarantees reliability of connection.Water-drains PLASTMO perfectly are in harmony with any architectural decision, have some color variants, and color does not burn out even after long-term operation.